Sweet seared scallops are exactly that: sweet and fishy. 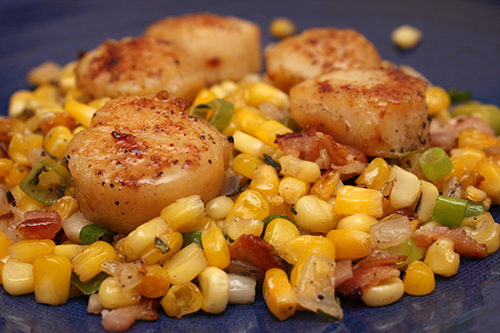 The recipe for “Seared Scallops with Sweet Corn and Bacon Sauté,” from the October/November 2018 issue of Fine Cooking, is an easy -- and special -- weeknight meal. The assembly is simple and unfussy. I used frozen corn, which tasted lovely combined with the shallot. Next time, I will take a significant step with the “Rosemary Shortbread Sandwich Cookies with Concord Grape Jam,” from the September/October 2018 issue of Bake From Scratch (recipe below).